Last week, we invited a friend of ours with her hubby over for lunch. 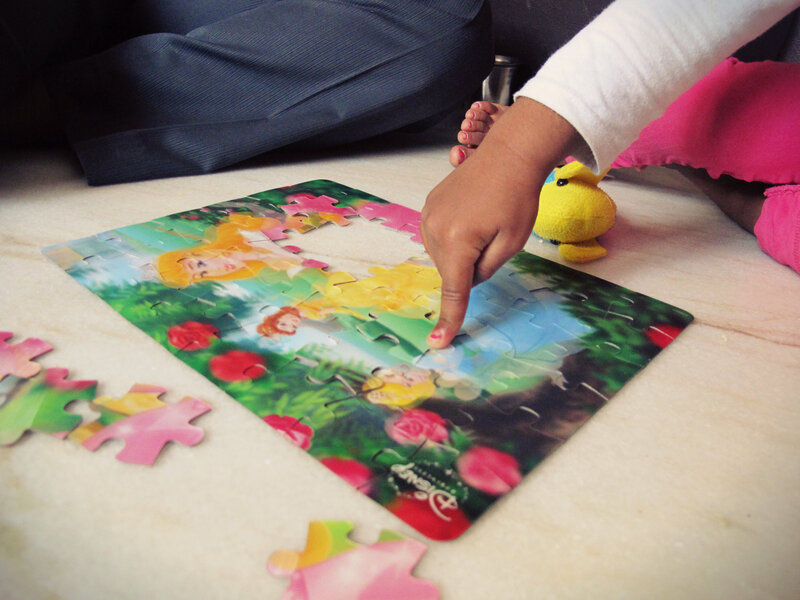 She gifted KT a 48 piece Princess lenticular jigsaw. I safely tucked it into KT’s shelf for later use as she’s used to only 8 – 10 piece puzzles at the moment. Of late I am trying to restrict her time on the comp and on my mobile while eating. As an alternative, I either read her a story or engage her in some activity while I feed her. This afternoon, she wasn’t interested in a story, coloring or her old puzzles. By hook or crook I have to make her eat lunch, else the mother in me wouldn’t be at peace. So! With no choices left, I released the princes puzzle! KT was jubilant when she saw those colorful 3D pieces. In her state of excitement the food started getting in faster (Woohoo! Mission almost accomplished!). The pieces were too many and the 3D effect made it more challenging to figure out where each piece fit. A plate of food in one hand and jigsaw pieces on another was beginning to get difficult to tackle. V, my hubby, who was waiting for his cab decided to join us (So thankful he did!). Now it was three of us around jigsaw pieces strewn on the floor. I fed KT, V figured where each piece went and KT would place the piece in its place! As inconsequential as it may seem, I began to savor that moment – three of us bonding over a piece of puzzle and plate of rasam rice! A sense of peace and contentment came over me. I felt my world was complete – food on the table, clothes to wear and above all, people to love and be loved! That’s when the idea struck – I should start a family tradition! A tradition that makes sure we spend quality family time on a regular basis within affordable means. Looking back it occurred to me that we mostly when about doing things in pairs – V & I, V & KT or KT & me. Yes, we do do a lot of things as a family. We go to church, travel, read, speak, play, laugh.. you know the everyday, common, routine stuff! This is the sort of tradition I hope/dream to start – nothing fancy and definitely nothing that would pinch our pocket. We may even choose to do something different from what’s listed based on our children’s interest. But one thing it would do for sure is, bring us closer as a family unit and unknowingly make memories that would last a lifetime and longer! Do you have such family traditions? Did your parents have such while bringing you up? How do you/did you enjoy it? Please share. Would love to read and learn! Beautifully written, Michelle, enjoyed reading it. About mine, our childhood days were very different, as those where the days devoid of TV….every evening was a fun-filled, quality one. The evening family prayer time was a MUST, with a few songs, bible reading , a small message from Mom or Dad and prayer by each one of us by turns(ours was a family of seven- Mom,Dad and five siblings 🙂 ) Dad on Sitar, brother on tabla, one of us on the tambourine and rest of us clapping ….. I really really cherish those memories. After that, dinner and small talk time. Summer evenings were the best, sitting in the courtyard and having long chats and hearing stories from our parents about their childhood. Another interesting activity was on days of power cuts ( which was a rarity those days) – hearing ghost stories…lol….we used to pester our parents for them and after hearing them enthusiastically, we used to be very scared to even go to the next room for a glass of water , we used to snuggle close to mom and dad and wait for the power to be restored. I also fondly remember playing chess with Dad, he was an ace at that and I used to feel on top of the world whenever I won a game over him ( now I wonder if he really lost, am sure he must have deliberately let me win at times, just to make me happy) Then there was Carrom Board, Chinese Checkers, Ludo, Snakes and Ladders to keep us and our minds busy, apart from our regular outdoor activities with friends in our neighbourhood like tennicoit, shuttle, and a host of others which involved a lot of physical activity like running, jumping ( and getting a few scratches and bruises in the bargain). In all these, Dad and Mom were always around and actively involved with us, never did we feel neglected in any way as those where the days when night shifts were not heard of, no mobiles – no disturbances, no intrusions into one’s privacy, no TV, less technology and more human activity. This was how we all, the generation prior to yours grew up, Michelle. In these present times, I am afraid I am unable to give half of these to Olly but yes, I try to make it interesting for her in whatever way I can, I did manage to procure a Carrom board and we three enjoy playing this as often as possible, then we do have a prayer time in the evenings, then there is story telling time, Sleepover time( usually Friday nights when we do a nightout playing some game, watching a movie etc)weekends mostly at the Mall, a visit to McDonalds, then playtime at the Bounce etc This is how it goes for us, dear……….under HIS protective wings……………..